Jumping into crow pose (kakasana) from downward facing dog (adho mukha svanasana) can be a lot of fun, and it’s super-energizing. If you’re feeling a little lethargic by the time you get to the arm-balancing portion of your yoga practice, jumping into crow might just pep you right back up! Still, this is a challenging transition; After all, you’re leaping forward and catching yourself with your own arms. It can feel frustrating, even impossible, at times. But breaking it down into digestible steps can make this “flying leap” from downdog to crow seem a lot less intimidating. Tip: If you feel a little nervous about falling on your face in crow, practice with a stack of pillows, a blanket, or a bolster so there’s something there to catch you just in case you need it. Begin in downward facing dog with your wrist creases parallel to the front edge of your mat and your fingers spread evenly apart. Make your downdog a little shorter than usual (short enough that your heels come to the floor, or pretty close to it). Next, walk your hands together so that the tips of your thumbs are touching. “Claw” the mat as you would in a regular downdog: keep your fingers spread wide and resist your thumbs toward your fingers and your fingers toward your thumbs. Now, walk your feet together. To prepare for the jump, on an inhalation, lift your heels, coming high onto the balls of your feet. On your exhalation, bend your knees, making sure to keep your heels and hips lifted. Suspend your exhale and jump your feet forward, landing them outside of your hands, to come into a wide squat, breathing again how you normally would. Then step or jump right back to downdog and then repeat the process a few more times: inhale, lift your heels; exhale, bend your knees; suspend the exhale while you jump forward; then step or jump back. The main thing you want to remember for this step is to “push the floor away”. Pushing the floor away as you jump forward will engage your serratus anterior, which hugs the shoulder blades against the rib cage and helps you to round your back (super-important in crow!). Pushing the floor away also helps you to find enough height to land your knees high up onto your arms in crow pose—even for just a moment! To try this step, come back to your short downward facing dog, this time keeping your hands apart (as wide as they normally would be in downdog). As before, walk your feet together; inhale, lift your heels; exhale, bend your knees. Then suspend the exhale as you push the floor away and jump forward, this time aiming to land your knees on your triceps (the backs of your upper arms) in crow pose. You might be able to hold crow for just a moment before momentum pushes you back. Try the jump into crow a few more times to get the feel of this transition: inhale, lift your heels; exhale, bend your knees; hold out the exhale and push the floor away—maybe finding the briefest of kakasanas before hopping right back out of it. As you discovered in the previous step, pushing the floor away gives us the height that we need to get into crow pose but also creates a momentum that can push us right back out of the pose. Step 3 is the key to not only getting into crow but staying there. Once again, begin in a short downdog. As before, walk your feet together, inhale and lift your heels, and exhale while bending your knees. Again, suspend the exhale as you push the floor away and jump forward; this time, as soon as you land, shift your chest forward (just a little bit—too much can lead to a face-plant), resisting your hands back against the floor (like you would for cobra or upward facing dog) to create a counterbalance that will prevent you from shooting back out of the pose. Thanks to this small additional movement, you can hang out in crow for a few breaths and then come out of the pose of your own volition. 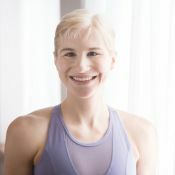 If you wish, you can return to downdog and then repeat this leap into crow, or you can even jump back from crow to chaturanga if that’s a transition that’s part of your practice.